Funding from major donors can mean the difference between a charity’s success or failure, yet many of us don’t set aside the time or resources to find and build relationships with the people whose financial support matters the most. create a culture that values major donors. 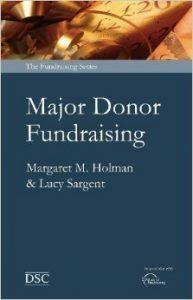 Margaret M Holman has over 30 years‘ experience in fundraising and runs her own successful fundraising consulting practice in New York City. Lucy Sargent is currently Campaign Director for a major gift appeal at UK charity SeeAbility.